Check out the pics from 2012’s Love to roll here! QUESTION: WHAT BETTER WAY TO CELEBRATE SUMMER, LOVE AND CYCLING THAN DRESSING FOR A DATE, HOOKING UP WITH SOMEONE WHO MAKES YOU FEEL GOOD, AND CRUISING THE GORGEOUS WELLINGTON COAST TO THE ISLAND BAY FESTIVAL? ANSWER: ALL OF THIS – PLUS THE CHANCE TO WIN GREAT PRIZES! LOVE TO ROLL IS FROCKS ON BIKES’ FAMOUS VALENTINE’S “DATE RIDE”. IT’S A FRESH, FUN AND FANTASTIC WAY TO CELEBRATE VALENTINE’S WEEKEND AND OUR GREAT CITY. “LOVERS TO ROLL”, DRESSED TO THE NINES, TAKE TO TWO WHEELS AND ENJOY A LEISURELY, MARSHALLED RIDE FROM ORIENTAL BAY TO THE ISLAND BAY FESTIVAL, VIA LYALL BAY. EN ROUTE, THE LOVE TO ROLL RIDE PAUSES TO JUDGE THE COMPETITIONS! LOVERS TO ROLL WILL VIE TO WIN THE TITLES OF BEST DRESSED COUPLE, MOST LOVED-UP BIKE, BEST-MATCHED BIKE AND RIDER AND MOST CHIC LOVER TO ROLL. DINNER FOR TWO AT HAVANA, DOUBLE MOVIE PASSES TO THE EMPIRE CINEMA AND FASHION FROM EMMA COLLECTIONS ARE UP FOR GRABS. AND THERE’S MORE – A BRAND-NEW, $1,000 AVANTI URBAN BIKE WILL BE WON BY ONE LUCKY PERSON! FROCKS ON BIKES WILL REVEAL THE LUCKY WINNERS ONSTAGE AT THE ISLAND BAY FESTIVAL. 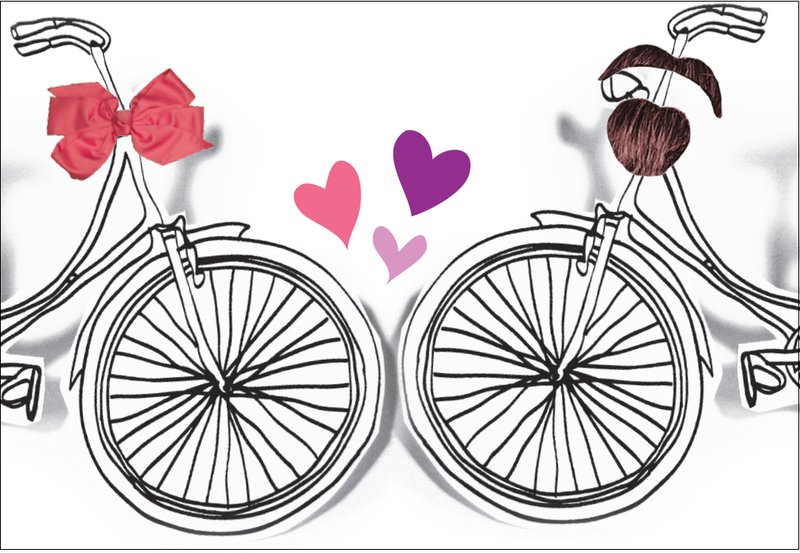 Love To Roll 2012 – loads of love, summer and cycling – with prizes! Dress code: dress for a date!